Mike Murdock once said, “the secret of your future is hidden in your daily routine”. More than often the thought of the future is an ambiguous one. Success is attributed to hard work and perseverance, whether it is or is not obvious. What is unseen, and not detectable at first glance, can be the crux of an individual’s future story and success. For 26-year-old Patrick Russo, a passion and profound talent for music production is hidden behind the façade he creates through his daytime persona. Pat works five days a week, twelve hours a day – but long hours are no problem for a job he calls a “hobby”. As a courier driver, Pat zips around the inner Sydney area, delivering packages to their awaiting recipients. “I love to drive and being able to do this as a job five days a week allows me to escape,” he remarks. Occupying his day with courier driving allows Pat to break out of the routine of his true profession, and to escape the confines of the indoors. By comparison, Pat’s primary profession certainly falls “on the opposite end of the spectrum”. He is a music producer for Offtap Beatz – a registered music production company, owned by Patrick. From an early age, Pat has been exposed to music. The far reaches of his memory recall his love for music stemming from his mother, who is a music teacher and pianist. “Over the years, hearing her students play, I picked up on it and ended up having a natural talent,” the self-taught Pat recounts. He describes his mother as being one of the largest influences on his musical career and the reason he was motivated to teaching himself how to read music and play different instruments. Pat’s talent and passion for music is not so obvious in conversation. According to friend Natasha Scali it’s something to see, to experience. “Being in the studio watching him and the vibe that is created, you can tell this is where his passion and talent lies,” she says. Natasha explains that the young producers ambition is apparent when looking at his music, and under his eyes – sleepless nights are a consequence of his underlying musical perfectionism. Pat displays the knowledge and talent of an experience and professional producer. Overcoming the various challenges he has faced, he has expanded his company and produce for popular emerging artists, all of which credit his abilities and talent. One day, Pat hopes to achieve fame, purely for recognition in the industry he is so fond of. He aims to prove that quiet perseverance, hard work – can lead to personal success within your passion because, at the end of the day, “it’s not about the money, it’s about the love I have for music”. Often there is more than meets the eye. For my assessment I will be interviewing Patrick Russo. By day he is a courier driver, delivering mostly around the inner city area – five days a week. By night, he is a music producer. His story will tackle his hidden natural talent as well as passion and love for all things music. He describes courier driving as a hobby as he enjoys driving, but also explains how driving for almost twelve hours a day gives him an escape from being in the studio. My story will centre around Pat, capturing his hidden attachment to music production along with some of the background information that have led him to love music. I intend to briefly interview one of his friends, to emphasise his hidden talent and passion for music production. Photographs will capture how different both of these jobs are but also capture the focus and attachment he has to his studio. By using black and white effects on each of the photos, I think tells his story as well as draw an attachment again to his studio. For sound he has allowed me to use one of his own instrumentals, I think this will highlight the authenticity of his music and showcase his talent. The backing track to the interview he has expressed to be one of his favourite instrumentals he has created. Pictures really do speak a thousand words. It is astounding to think how a single image has the capability of expressing what words cannot. emotions”. 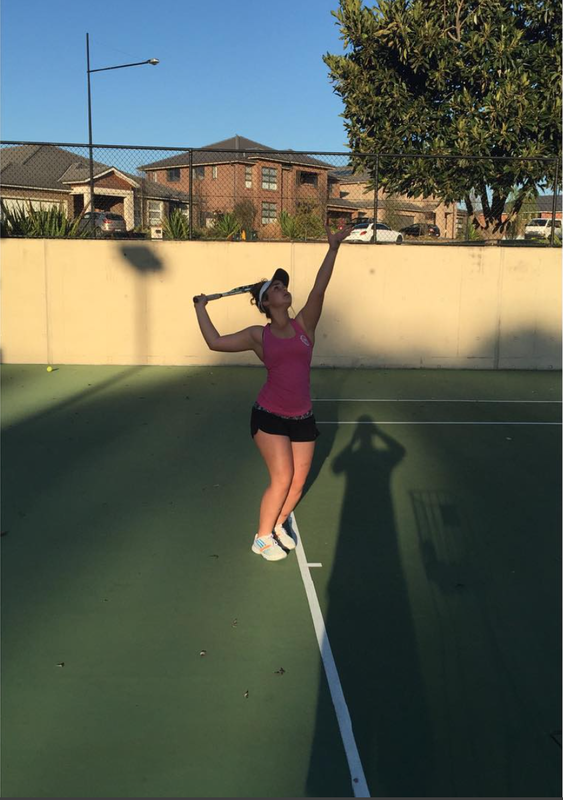 In an interview she elaborates how this relationship with the tennis court allows her to ‘grow’ and reflects on a memory that highlights the happiness tennis brings. Coming from a family so immersed in the game of tennis, myself and my sister have grown up in the game. But what I have noticed is that we both have a different meaning and a sentimental relationship to the game. I thought it would be intriguing to know how playing tennis makes her feel and the connection she has with the court. She describes hitting the ball as “freeing”, I have the idea to capture the different sounds each shot makes as she hits the ball. I want to capture the routine of pulling up to the courts, placing her bag on the bench and then going for a run to replicate this sense of routine. As part of playing tennis comes the next level of playing inter-state, from memory she has one particular final that shaped her outlook on the game and her motivation. Recreating her last shots and the atmosphere of outside the court will construct a nostalgic feel to the the interview.